HBO NOW Review: How Does it Compare to HBO GO? HBO Now is out on Apple TV. How does it compare to HBO GO? What can you expect as far as usability and functionality? Find out in this HBO NOW review. Update 4/9/15: HBO is now live on SLING TV! Update 7/22/15: HBO NOW has been added to Android 4.1 OS and later phones and tablets as well as the Amazon Fire Tablet. I’m not an Apple TV guy (I prefer the Roku 3), but luckily one of my buddies is on the brink of becoming a full-fledged cord cutter and recently bought an Apple TV. So when I heard HBO NOW was dropping, I rushed over to check it out. I watched as he subscribed via Apple TV and received his free 30-day trial. He then got a prompt letting him know that he would receive an email with instructions on how he could watch HBO NOW on his mobile devices and computer. While he messed around with his Apple TV remote, I logged into his email for him and got things set up. The interfaces are almost identical. The only noteworthy difference is that HBO NOW lists “Series” before “Movies” whereas HBO GO has featured movies first. This makes sense, as the big push for HBO NOW is the new season of Game of Thrones. HBO NOW is also much more aesthetically pleasing. In fact, it just feels more cutting edge. You can tell they spent some real time thinking through the layout. Just check out the difference between the HBO NOW and HBO GO “Collections” screens. There were a lot of questions about what content would be featured on HBO NOW. Would it include special content not included on HBO GO? Or would it essentially be the same thing? At a glance, it seems like the content is identical. Both feature all of HBO’s hit TV shows. And the movie libraries both currently begin with 10 Things I Hate About You and end with You Don’ t Know Jack. HBO NOW offers the same selection of documentaries should you want a dose of the real world and the same late night content if you’re feeling…adventurous. The sports library is there as well. So as far as I can tell, the content offerings are the exact same. Will HBO Allow Password Sharing with HBO NOW? Millennials We all are notorious for sharing HBO Go passwords. And HBO never seemed to mind, as this much-referenced article points out. But will that easy-going attitude continue with HBO NOW? Interestingly enough, it’s already addressed in the Help Center. This doesn’t sound like a hard stance, but it’s worth noting that HBO is in the money-making business, and they’re definitely looking for HBO NOW to be a money maker. And while they’ve added an option for HBO NOW users to add authorized users, much as Netflix has done, they say these users should be limited to the subscriber’s household. However, Verge’s Chris Welch doesn’t seem to think that will happen. 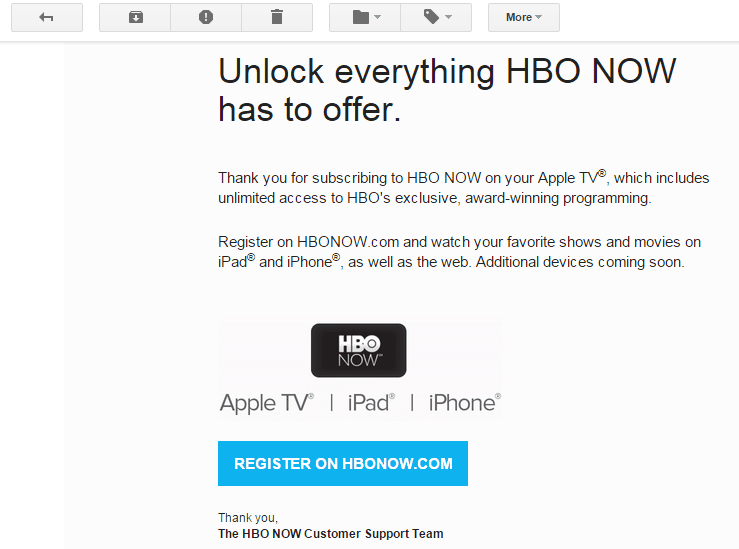 HBO Now subscribers can add “authorized users” to share access. HBO says this should be limited to your household. Yeah, right. If You’re an Apple TV User, Why Not Give it a Try? If you have Apple TV, you can check out HBO NOW for free for 30 days. Just sign up by clicking on the app. If you don’t have Apple TV, you could purchase one for $69 if you feel like it’s worth the money to get HBO NOW. Your other option for streaming HBO content without cable is to get Sling TV (they offer a free 7-day trial). UPDATE: Turns out that any Apple device will work. Just go to the App store on your iPhone or iPad and download and sign up via iTunes. The cool thing about this is that if your an iPhone or iPad owner, you can get HBO NOW on your TV without springing for an Apple TV. For example, if you have Chromecast, you can cast HBO NOW to your TV. Or you could get an HDMI cable and connect it to your TV. Questions about HBO NOW or Apple TV? Fill out the form below, and I’ll get back to you. You can also check out my cord cutting guide here.